Off Lanzarote’s northern tip is the paradisiacal island of La Graciosa. Glorious volcanoes on deep slumber embellish its vast golden sand desert. Galloping towards its stunning shoreline is the world’s most crystalline waters. Pristine, natural, and marvelous, it is a destination that is reminiscent of the old Canaries. Some studies claim Jean Bethencourt came and conquered La Graciosa before sailing to Lanzarote in 1402. If true, that makes the desert islet the first in the Canaries to be under the Castile crown. What is widely known, though, is that it is the last of any island in the archipelago to be inhabited. La Graciosa, in the 19th century, sparked business interest in the fishing and salting sector. Allegedly, even the U.S. government offered to purchase the island from Spain for those purposes. Ultimately, though, it was the businessman Ramón de Silva Ferro who was authorized to build facilities for fishing, salting, and fish products manufacturing. Workers were then brought in from Lanzarote to get it up and running. Unfortunately, the venture was proven unsuccessful and went bankrupt after two years. The facilities were then divided amongst the workers, and that’s how the first settlement of La Graciosa, Casas de Pedro Barba, was born. It is from Mirador del Rio where most people first lay eyes on La Graciosa. An undeniable beauty even from above El Risco de Famara, many find themselves traveling across the narrow strait of El Rio to visit the islet. A picture of calm and charm, the views were too enchanting to refuse. First to greet visitors is Caleta de Sebo, the island’s capital, and largest settlement. The unblemished alabaster harbor town, specked with a teeny bit of hue, is dreamy. Even the docked boats are mostly of the same color. Truth be told, white never looked this handsome. 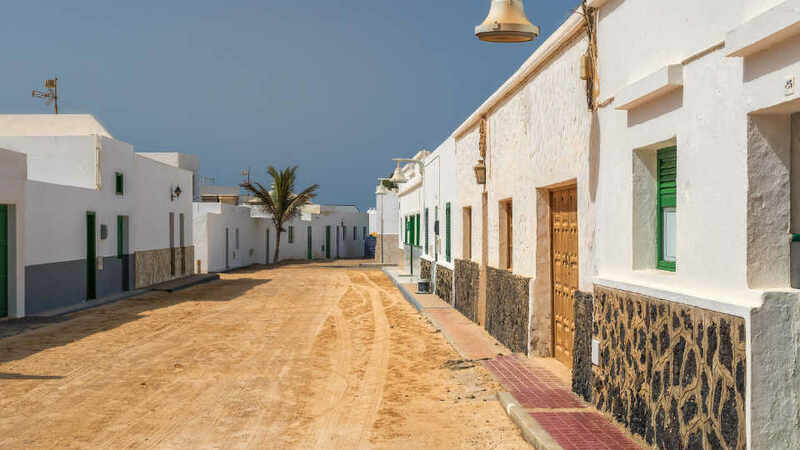 With still unpaved streets and roads, the hamlet feels unmanufactured and authentically Canarian. The earliest tourists must have felt the same when they came to the archipelago, and it is the reason they kept coming back. Fitted with businesses like a bakery, DIY shop, small supermarkets, a nightclub, and some bars and restaurants, it’s not entirely devoid of essential comfort and leisure. Alongside rows of whitewashed houses with either blue or green windows and doors is the Nuestra Señora del Carmen church. The quaint little parish is undoubtedly pleasing to the eyes. Don’t just pass by it or admire from the outside, though. Within its walls are fascinating references to the fishing industry and fishermen from which the town emerged. Do check the inside if its wooden door is open. Although smaller of the two settlements on the island, Casas de Pedro Barba, as a matter of fact, is older. From its fishing and salting beginnings, the facilities were transformed into lovely abodes. However, unlike Caleta de Sebo, the community did not flourish. Today, the residences are mostly only utilized during summer. La Graciosa, like the rest of the Canaries, is of volcanic origins and is home to four inactive volcanoes. Although not of towering stature, they are a delight to the desert landscape. One can’t help but notice that they are all very well positioned too. It is as if they were laid out that way by design. At the very center of the islet are Las Agujas Grandes and Las Agujas Chicas. They are the tallest of the quartet at 266 and 257 meters respectively. On the north and neighbor to Playa de Las Conchas is Montaña Bermeja. Its name means “scarlet,” and it is indeed. With a red cone, it stands out from its ocher surroundings. At the southern tip is Montaña Amarilla, half of it is by the waters while the other on land. Attracting attention due to its amber color, it is quite a sight from the Playa de la Cocina and Playa Francesa. La Graciosa is the epitome of natural magnificence. As part of the Chinijo Archipelago’s nature and marine reserves, the islet has exceptional landscape and aquatic value. Truly blessed are those who can witness both splendors at the same time. Imagine lying on the fine golden sand with views of the volcano and the greenish-blue waters. No parasols and sunbeds spread on the shoreline. Only a few wandering souls just as blown away like everyone else. Some visitors prefer to stay near or within Caleta de Sebo, which isn’t a bad idea at all. To enjoy some beach time without breaking a sweat, head to Playa La Laja which is just next to the harbor. It’s small, but much like the other beaches on the island, it has excellent golden sand. For tucked away beaches that are still near the settlement, follow the seacoast on the left. Playa El Salado is at Caleta de Sebo’s left end, and further south is Las Piconas. Spread at the foot of the ocher Montaña Amarilla, at the island’s south, are three majestic surfing spots – Playa Francesa, Playa Montaña Amarilla, and Playa de la Cocina. The first is recommended for beginners, whereas the last is for experienced surfers. As for the middle beach, Playa Montaña Amarilla, it is a small naturist haven with splendid waves. Another famous seaside for wave warriors is Bajo del Corral at the west of La Graciosa. 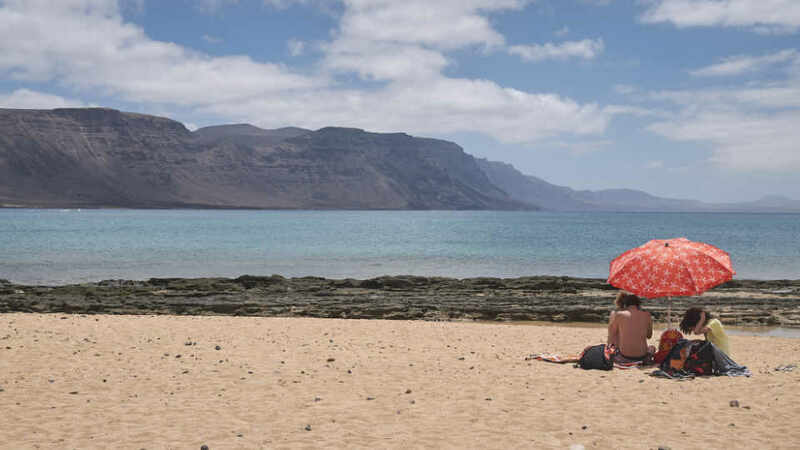 Regarded as one of the Canaries’ most beautiful virgin beaches, Playa de Las Conchas is La Graciosa’s brightest star. It is a 610-meter-long untouched coastal beauty of magnificent white sand and is as perfect as it looks in pictures. Vacationers who wish to bask in the sun, lie in raw nature, and listen to the music of tranquility must head here. Aside from Casas de Pedro Barba and its rustic beach, there are two other attractions up north that are well-deserving of everyone’s attention. Enveloped by rocks, the concealed Playa Barranco de Los Conejo is only accessible by foot. It may be tiny, but it is an image of calm draped in white sand. Further to the north is the volcanic rock arch of Los Arcos. Here, tourists can sit on the natural bridge and watch as seawater enter and recede from the corridor of the formation. To get to La Graciosa, holidaymakers must go to Orzola first, then go by boat to Caleta de Sebo, the island capital. The 15-minute journey costs €20 for adult passengers and €11 for children. Those coming from Arrieta and Punta Mujeres, need not go to Orzola. They can opt to hire a Lineas Romero water taxi that will collect and also return them. 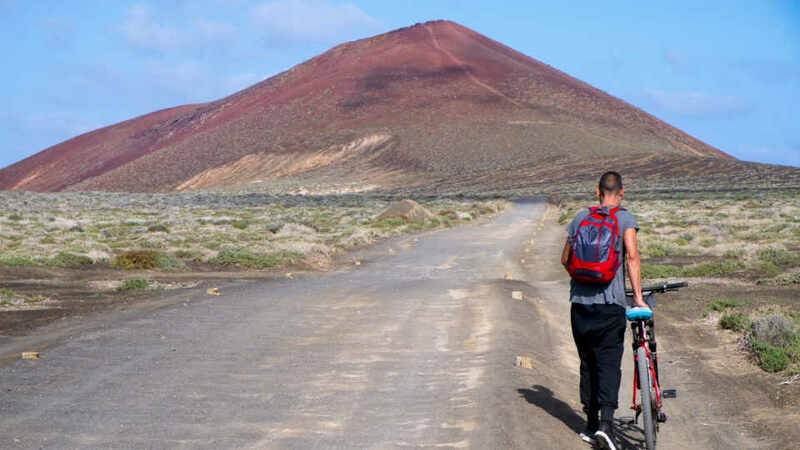 Many travelers prefer walking to the many attractions of La Graciosa. Be prepared, though, as there are no palms or trees past the capital that can offer shade to tired travelers. No bars, stores, or shops either, so bring packed food and plenty of water. Those who do not want to traverse the island by foot can hire a 4×4 taxi. As there are only dirt tracks around the island (including Caleta de Sebo), regular cars won’t do. They can be hired for an island tour that covers all the main sites. It takes about an hour and costs €40 per jeep, not per passenger. For an additional €20, drop-off and pickup from a particular attraction can be arranged. Admire La Graciosa’s beauty from the sea and still get to prime attractions via water taxis. This mode of transportation is available every day at the Caleta de Sebo harbor for €8 per person. There is a bike rental shop in the Caleta de Sebo port area where mountain bikes can be hired for €10 per day. It also comes with a map of cycling routes to places of interest. There are no hotels in La Graciosa. However, there are plenty of apartments or rentals. As they are all in Caleta de Sebo, two things are guaranteed: tranquility and access to amenities such as restaurants, bars, and supermarkets. Big families or groups can go to Evita Beach Apartamentos or La Graciosa House. The prior offers suites and an apartment with terrace, spacious living-dining area, and a fully-equipped kitchen. Perfect for those who prefer large holiday homes, the latter comes with four bedrooms, living room, kitchen, two bathrooms, and terrace. As for couples or groups of up to four persons, Apartamentos Calima and Casa del Rio are fantastic options. Both have a fully-equipped kitchen, so guests can whip up their meals if they want to. Those who want more space and a balcony/outdoor seating area, the latter, a holiday home, is the better choice. Caleta de Sebo is the only place in La Graciosa where there are business establishments. The good news is, although only a handful, the restaurants here seemed to have already mastered the art of cooking Mediterranean, Spanish, and Canarian dishes. Especially delightful are their seafood choices and ‘fish of the day.’ Also, as most are by the harbor, diners get to enjoy their meal with the views of the El Rio Straight and the colossal Risco de Famara in mainland Lanzarote. While Casa Enriqueta is neither seafront nor near the port, it is the most popular. Their marine salad, pulpo a la plancha (grilled octopus), t-bone steak, sirloin cuts with mushrooms and capers sauce, escaldón, fried sardines, and arroz caldoso are divine. They are also vegetarian-friendly, just let them know, and they’d happily prepare plant-based dishes. Another must-visit is Restaurante El Marinero. Their most in-demand dishes are mixed fish platter, fish balls (albondigas), tapas, garlic prawns, seafood stew, gallegada de mero, Canarian potatoes, and carpaccio. For the best paella in the island, march to Girasol. They also have lovely pulpo a la plancha (grilled octopus), puntillas de calmer (baby squid), and garlic prawns. One giveaway that food is incredible is if it’s a local favorite. This is precisely the case for Casa Chano Bar La Caletilla, the go-to place for the island residents for tasty eats. Along with tourists, they sing praises for the house salad, limpets, grilled octopus, grilled tuna, and tuna in a batter. What better plates can pair with wine, cold beer, or the breathtaking views? La Graciosa is often called the eighth Canary Island. Well, it does have a beautiful ring to it. However, it deserves to be called something else, something much more. Unaffected by all the ‘growth’ that has swept the archipelago, it is still dazzling and natural. It has endured. It is the unscathed Canary Island.